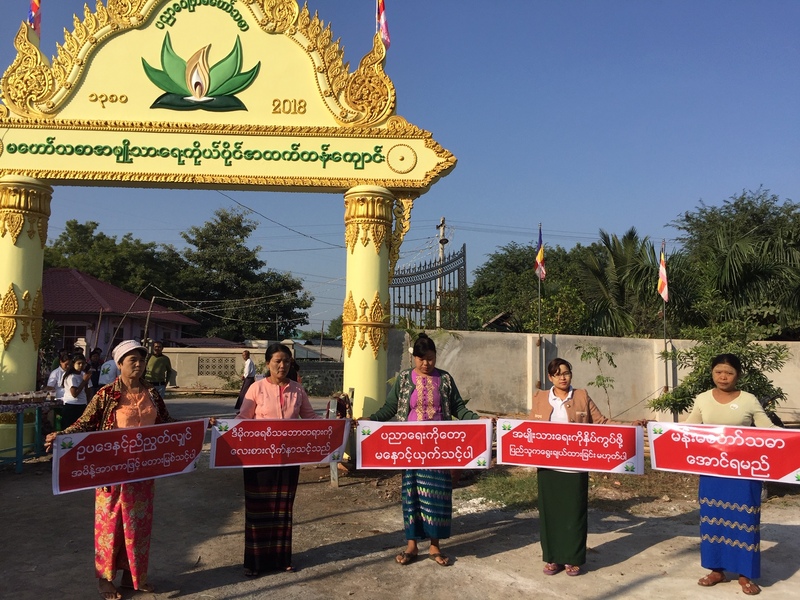 MANDALAY — Firebrand monk U Wirathu accused the government of stalling permission for a private high school in Mandalay Region’s Patheingyi Township because avowed nationalists were behind the project. “The regional government says it is illegal to have a school compound on this land. But their refusal to let the school open is not based on that,” he told reporters at a press conference at the site on Sunday. In March 2017 the government banned U Wirathu from delivering public sermons for a year over his strident anti-Muslim rhetoric, and Facebook blocked his account in February for hate speech. The government has also outlawed the ultra-nationalist group Ma Ba Tha, which has since rebranded itself to skirt the ban. U Wirathu said on Sunday that he and his supporters have been asking for permission to build Mahawthadar Nationalist Private High School for more than a year but were yet to receive it. “This school has nothing to do with politics and has no anti-government intentions. It is only to give free education to poor children. The government is trying to oppress everything the nationalists are doing — this is not democracy,” he said. “We cannot wait any longer, so we will begin construction regardless what happens. If the government does not follow democracy, abuses the rule of law and wants to oppress us, I will make sure to let them know who Wirathu is,” he added. The monk said he had also written to Mandalay Region Chief Minister U Zaw Myint Maung in July to ask for permission for the school. The letter, distributed to reporters on Sunday, says the committee set up to establish the school includes former government officials, including the personal secretary of the prior regional chief minister. “Don’t look on these committee members and think there will be any politics or nationalism. Every one of them is focused only on education and is not thinking of politics or nationalism,” the letter says. “If members of the NLD or the government wants to join us, you are warmly welcome, but you should keep nationalism in your minds,” it adds. Mandalay Region government officials could not be reached for comment. Project backers said they applied for permission to build a four-story school in Kyauk Chaw Village in mid-2017 and had hoped to open it for the 2017-2018 academic year. They said the regional government has asked for several required documents and rejected a request to hold a groundbreaking ceremony in February. “Since then there has been silence. We’ve sent a complaint letters to the President’s Office as well, but the President’s Office is also ignoring our complaint,” said U Myo Chit, vice president of the school’s founding committee. He said two Mahawthadar high schools have been operating since last year, one in Yangon and another in Rakhine State. “We believe the [Mandalay] regional government does not want to give us permission because the word “nationalist” is in the school’s name. We will not take it out to get permission, because nationalism is as important as education for children,” U Myo Chit said. “However, we are not going to emphasize nationalism, which the government is worried about. We are only going to provide the children with free education. We will begin construction no matter what, and we will make sure the school can open in time for the 2018-2019 academic year,” he added. Those behind the school project have already built a gate and fence around the site and a classroom where about 200 students from surrounding high schools are receiving free after-school tutoring.